When it comes to girl group Apink, the general public is most familiar with the representative who is known as the visual of the group, Naeun. Her innocent beauty has always been popular ever since the early days of Apink. Therefore, it is expected that compared other Apink members, everything that Naeun does must appear in media outlet often, be it the positive or negative news. 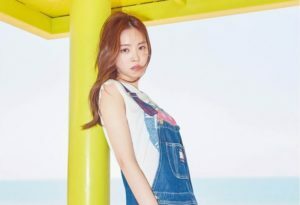 In this article, Channel-Korea will explain all about Apink’s Naeun, starting from her personal profile, fun facts, family, lists of her drama, films, television shows, plastic surgery, diet tips, Adidas advertisement, and Instagram feed. So, keep reading! Hobbies: Collecting, drawing, listening to music, and buying clothes. As explained in her personal profile earlier, Apink’s Naeun was born in 1994. According to the Korean Age System, in 2018, Naeun’s age is 25 years old and according to the International Age System, Naeun is 24 years old. There is one unique trivia regarding Naeun and her age. Apparently, Naeun has the exact same birth date and year as Red Velvet’s Seulgi as both of them were born on February 10th, 1994. Besides Naeun, there are other Korean female and male idols who were born in 1994 as well, such as Lovelyz’s Mijoo and Jisoo, Red Velvet’s Seulgi and Wendy, Suzy, f(x)’s Krystal, Sulli, and EXO’s Kai and Sehun. On the other hand, Naeun is considered as a tall and thin girl as her height is 168 cm, whereas her weight is 45 kg. Naeun used to be a JYP trainee. Naeun is the first Apink member who was revealed to the public. Naeun enjoys listening to sad music. Along with Chorong, Naeun is quite skillful in artworks. Naeun’s favorite colors are black and burgundy. She is often seen wearing clothes and goods in these colors. Instead of hating her anti-fans, Naeun claimed that these people are also loved by her as well. Naeun likes to touch her hair a lot. She considers it as a bad habit. During her appearance on MBC’s Radio Star, Naeun said that she has a crush on TWICE’s Tzuyu. Naeun received a nickname ‘GoToNyu’ from a former Apink member Yookyung because she always carries sweet potato and tomatoes in her bag. Naeun’s ideal type is someone who is honest and has a manly personality. Dynamic Duo’s Choiza was once chosen as her ideal type. There is little information known regarding Apink’s Naeun and her family. It was stated that Naeun comes from a well-off family as her father is a professor, whereas her mother is an owner of a art gallery. In an interview, Naeun said that she talks often with her mother regarding life and future goals, and proved that by uploading pictures of dates she has with her mother. Not only her parents, but Naeun also has a younger sister named Son Sae-eun who is a professional golf player. Instead of resembling her older sister, many people think that Sae-eun looks more like Krystal, while the rest insist that Sae-eun is more similar to Naeun. When they hang out, Naeun occasionally shares the photos with her sister as you can see below. Being the first Apink member who ventures in the field of acting, Naeun is often criticized for her lackluster skill. Even so, she is not greedy compared to other idol-turned-actress who usually get main roles in their first attempt, as Naeun consistently took offers as the supporting roles. Besides drama and movies, Naeun also often appeared in various programs, such as Running Man, Knowing Brothers, and Idol Star Athletics Championship, making her a familiar figure to the general public. Here, you may check the list of Naeun’s drama, films, and variety show list below!